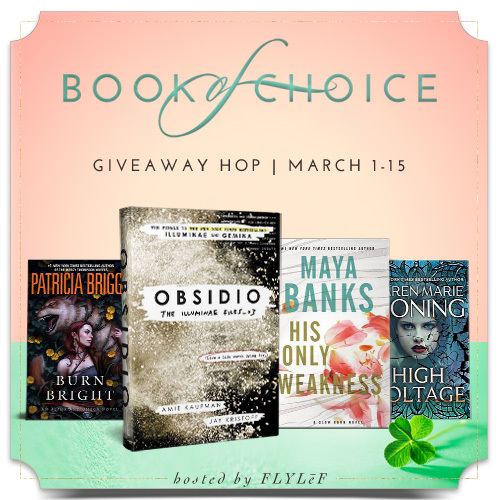 Enter this giveaway for a chance to win a March 2018 new release of choice worth $15. Good luck! The Wildling Sisters is an amazing gripping story. I was captivated by Margot and her family history from the start. I love reading about old houses and am a big fan of mysteries, so the vanishing of Audrey is something that kept me on the edge of my seat. I loved how Eve Chase sets her story both in the past and the present, which makes the impact of Audrey's story as huge as possible. Each main character is interesting and I loved their versatile personalities. Margot is a sweet and perceptive girl. She can't let her cousin go and while her sisters seem to be able to move on, she's somehow stuck in the past. Bella is fascinated by this same story many years later. Her connection to Audrey is her room and therefore she's just as strongly involved, but in a completely different way. I loved how Eve Chase connects the two stories and was blown away by both of them. Eve Chase knows how to build tension and that makes her story suspenseful and thrilling. She kept me on the edge of my seat from beginning to end. The Wildling Sisters is a story to read in one sitting because it's too good to put down. I love books about sisters and this is definitely a great one. There are plenty of surprising twists and turns and the complex relationships are intriguing and well thought through. Eve Chase combines this with a beautiful setting that can be both creepy and inviting at the same time. I really enjoyed reading The Wildling Sisters, it's a fantastic thrilling story that I highly recommend. 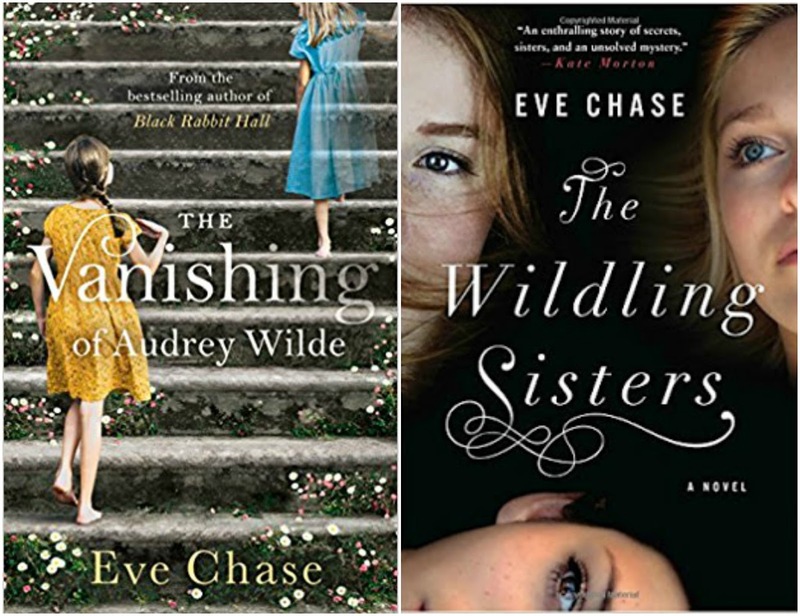 If you love stories about siblings, old houses and secrets you should definitely read The Wildling Sisters. In no particular order: I only started driving in my forties; I was phobic of dogs until I got one last year; I can whittle away hours looking at garden plants online; I love ferns, Johnny Cash and dark chocolate; I’m totally addicted to The Crown on Netflix. 2) You write about family secrets, what was the inspiration behind Audrey’s mysterious disappearance? A child disappearing is a primal thing. We’ve all had that moment, in a supermarket or a parking lot, when we look around and can’t see our child. The heart stops. Life stops - until we catch sight of them again. I wanted to write about that. 3) Applecote Manor is a house with a history, is it based on a real place, where/how did you get the idea to write about it? 4) You explore family relationships, how do you come up with the different connections and is it difficult to describe the emotional side of them? How do you prepare for the deep issues? I have the characters’ basic family tree ordered before I start but the emotions develop as I write: I pull some forward, others back, to speed up the plot and keep the story cohesive. I would love to be one of those novelists who have everything pre-planned but it doesn’t happen like that for me - I think as I write. 5) Your writing space sounds great, can you tell a bit more about it? It’s a little wooden studio at the bottom of the garden, where I procrastinate by looking at the flower bed and birds. I love gardening and seeing the seasons change outside my window brings both joy and deadline panic. I have a dog - a very hairy golden retriever called Harry - who likes to lie by my feet and has lent the place a bit of a doggy pong. My three children think it’s really funny to turn the lights out in the studio from inside the house. My husband runs a business from the studio next door. We iChat each other, wondering if it’s time for lunch. It usually is. 6) Buildings play an important part in your stories, what’s your favourite kind of fictional place and what kind of buildings are inspirational for you? Houses are important because they’re usually the hub of the family, the private space where dramas get played out. The building doesn’t have to be beautiful or grand to be interesting but it does need character, a soul. And if it doesn’t have it - say, we’re talking about a very bland apartment, with no personal touches - then that in itself is important and curious since it says a huge amount about the character who lives there. Dwellings reveal their inhabitants. 7. How did your passion for stories start? I was that little girl with the diary, endless notebooks and the well-used library card. I’ve written since I can remember. I was also very lucky to have very well read, loving grandparents - both died in their late nineties - who hugely encouraged me. I’d go and see them for tea and their first question was always, ‘So, what are you reading?’ They believed books mattered. 8) You also work as a journalist, how is it to combine writing articles with writing stories? I do less journalism now - fiction takes up most of my time - but so much of my earlier journalism has fed into my novels, the characters, the travel, the houses…I think it’d be really hard to write books without having lived a full life first. 9) You write about big families and are also part of one. What does family mean to you? Not much in my life would make sense without my children. They inspire me to get up in the morning and keep going. And they’re expensive! I need to earn. I’m not sure the perfect family exists though. Most of the time, we’re all just trying to muddle through, and do our best for those we love, and that’s okay. All families have secrets. I’d like to clone myself, or learn to write books quicker! I’m working on it. 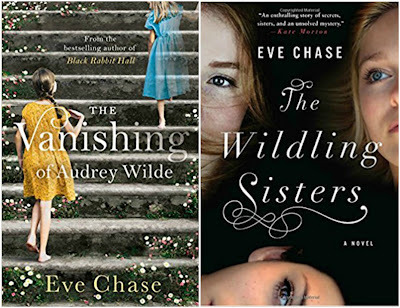 One very lucky reader of With Love for Books will receive a hardcover copy of The Wildling Sisters by Eve Chase. Suze and Anniek both love to do author interviews. It's wonderful to read the information they've made available on their website and then think of the amazing things we can ask them. We also like to come up with more detailed questions that are related to their stories. As we love to get to know the authors we feature better, we thought it would also be nice for our readers to get to know us a little better, so this time Anniek and Suze will be answering your questions. Please feel free to ask new questions and we'll answer those in our next interview post. We'll answer them all, so if your question is not among the following ten, it will turn up in of our next interview posts. The questions we've chosen are all questions that have been asked by you in our previous post. Anniek: Pizza and Sushi! I could have either of them or both every single day. With two young children I'm glad to get some actual sleep, but for Pizza or Sushi you may wake me up. Suze: Scallops and lobster in any way. I love fresh seafood. I also have a bit of a sweet tooth and really like ice cream. You can always wake me up for a well prepared meal. I love fancy dinners and save for them to have something special every now and then. 2. Do you prefer actual books or digital ones? Anniek: Nothing can ever replace the feel of a physical copy of a book, so if I should have to choose it would be a physical book every single time. In reality I mostly read on my Kindle because it's way more convenient and easier to take with me wherever I go. I never leave the house without at least one device on which I can read. Suze: I love having actual books, there's nothing that can beat the scent and feeling. However, I prefer reading digital copies. It's convenient if I can make the print as small as possible and have some influence when it comes to line distance. This way I can read comfortably and that is something I like a lot. I also never leave the house without a device. They're much lighter than a book and can easily be carried anywhere, so that's another advantage of digital reading. 3. 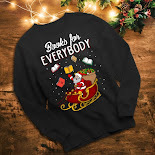 If you could actually live inside a particular book genre which one would you choose? Anniek: I love this question! Since horror is my favorite genre I have to choose this one. I don't know how long I'll be able to survive in a zombie apocalypse, but I'd give it my best shot. I'd probably stay inside the house for a while, until everything settles down a bit and I'd board up the windows so nothing or no one could get in. After a while I'll use my roof to get to the other houses around ours to see if there are other survivors, or if the houses are empty to find out if there would be anything I could use. Suze: I'm a bit less adventurous than Anniek, I'd choose magical realism. I like a little bit of magic in our daily existence and would be curious to find out what it would do. Of course I wouldn't say no to having a special gift myself. It would be fascinating to see what this would accomplish. I'd love to live in a Sarah Addison Allen kind of world. 4. How long did you write to each other before meeting for the first time? Anniek: Oh my I must say that I have no idea. I don't think it was more than a couple of months. I do know that Suze and I clicked right from the start even when we were still writing I knew I found my best friend in the whole wide world. If there's anyone who can brighten up a crappy day then it's Suze. She always knows how to make me smile. Suze: I also can't remember exactly, but it indeed wasn't long before we decided to meet and when we started talking we just couldn't stop. Nobody could get a word in and people always had to laugh when they saw us together in those first years. We have calmed down a little these days, but not much. I knew straight away that it would be a forever friendship and still feel very lucky that I asked Anniek to be penpals. 5. Did you ever meet your favourite authors? Anniek: Oh I wish! I have so many favorite authors and I do hope that one day I get a chance to meet some of them. I've been a fan of Stephen King ever since I was a teenager and it's on my bucket list to hopefully meet him one day. Suze: Not many, but I hope I will meet as many author friends as possible in the future. It always involves travel and is not easily planned, but sometimes chance meetings are happening and those are absolutely fabulous. 6. Do you have any ideas about what you'd do to encourage young people to read, do you think it should be done in schools or at home? Anniek: I love to read with my children. In the beginning it's not even the reading that they like, but just being with you and hearing your voice. It's part of our bedtime ritual and my son (who's the oldest) gets to choose the book he'd like to read. It won't be long until he has to share this privilege with his younger sister. Lately we've been reading about Peppa Pig a lot, but he also loves The Hungry Caterpillar. Suze: My father always read to me and my brother in the evening when we were children and my mother did the same during the day. I grew up in a house filled with books and was also lucky to have some book crazy teachers. I think it doesn't matter how children are being inspired to read, as long as they are. What I do find important though is that they get the message they can read whatever they like. There is no right or wrong genre, the fun of reading is something that should be taught to them, so they know what joy it can bring. If reading becomes a chore it's easy to resent books instead of loving them. Fortunately books are much more easily accessible these days, so a certain genre can be within reach while it might not have been a few years ago. I hope anyone who loves books will inspire someone else to read more. Anniek: This is a tough one. I'll keep it into the books that have been made into a movie. I'd send Matilda (Roald Dahl) to meet Harry Potter, since I think that she would be the cute little sister he never had. Suze: I'd send Alanna from the Song of the Lioness series to Narnia. I think she'd thrive there and she's a good wing woman to have in combat. 8. If you could travel back (or forward!) in a time machine, what era would you like to visit? Anniek: I would love to go back in time to when dinosaurs still roamed the earth. I have watched all of the Jurassic Park movies multiple times and I'd like to find out how the world looked like then. Suze: I don't think I'd survive in the past very long, so I'd love to travel to the future. It is a risky choice, because you never know what life will be like. If I'd randomly choose the year 2075 to travel to I might end up in a warzone, but even though there are risks I'd still be curious enough to check it out and see what kind of advantages have been made. 9. How many books do you bring with you when you travel? Anniek: I bring my Kindle, my Ipad and my phone which has the Kindle app. I don't take physical books with me because I'm a bit anxious that they might damage in my suitcase or when we'd be at the swimming pool. So my physical books actually never leave the house. Suze: I bring two ereaders and a box filled with paperbacks. Being without books is too much of a risk, so I'd like to be prepared. 10. What is your favorite book from your childhood? Anniek: In English class we had to pick a book which we had to read and present to your classmates after you finished reading. I chose The Secret Garden and I have always loved that book. I have a copy on my bookshelf and I can't wait to read this book to my children. Suze: The Letter for the King by Tonke Dragt because it meant a lot to someone very dear to me and it's a beautiful story. One very lucky reader will receive a beautiful flower bookmark and a book of choice worth $12 from us. 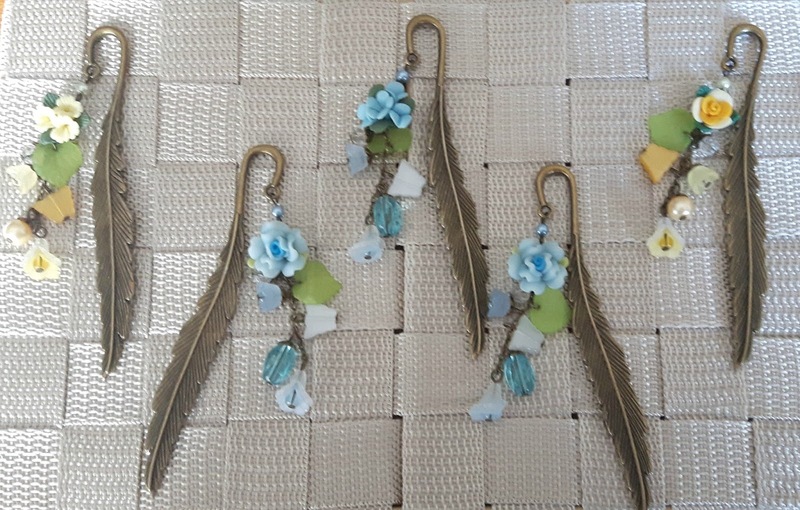 Four runner ups will get a beautiful flower bookmark. After a difficult breakup Bobbie is now living with her twin sister Jess. She's having a peaceful and quiet life until she meets Ross. Bobbie used to like Ross a lot, but they lost contact. Now Ross is offering her his uncle's lighthouse for a symbolic amount. It's her birthday and Bobbie is ready for a challenge, so she decides to buy it. She has an even better idea though, they should purchase it together instead and open a music venue, which is something Ross has been dreaming of for years. Will they be able to pull it off? Ross gave Bobbie her first kiss and the butterflies in her stomach that were there back then are still present. However, Ross isn't as unattached as Bobbie would have liked him to be. He's a man with a lot of baggage and Bobbie has to decide if she can handle taking this. Will getting involved with him jeopardize their lighthouse project or can they remain professional? What will happen when secrets of the past are coming to the surface, will Bobbie and Ross be strong enough to survive whatever comes their way? 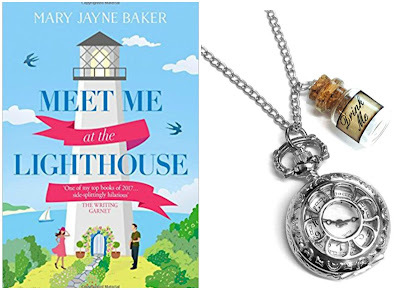 Meet Me at the Lighthouse is a wonderful story. Bobbie is a fantastic person. She's smart, knows how to get things done and she's sweet. She used to like Ross a lot and sparks keep flying between them. Ross is kindhearted and easy going and he's a talented musician. They get along fabulously, but they also have a project to take care of and being involved personally and professionally can be a challenge. It was fascinating to see what would happen between them. I loved their playful banter, great chemistry and close friendship, but things aren't as uncomplicated as they seem, which gives the story a nice layer of depth. There are things Ross can't share and finding out more about his secrets kept me glued to the pages. Mary Jayne Baker has a fabulous easy flowing writing style that mesmerized me from the very beginning, I just had to keep reading. I loved the way she describes the lighthouse and everything that has to be done to turn it into a music venue. It was fun to read about the ups and downs of that process and the amazing community spirit put a big smile on my face. I love heartwarming stories and Meet Me at the Lighthouse has the exact right feelgood factor. I really liked this book and highly recommend it. 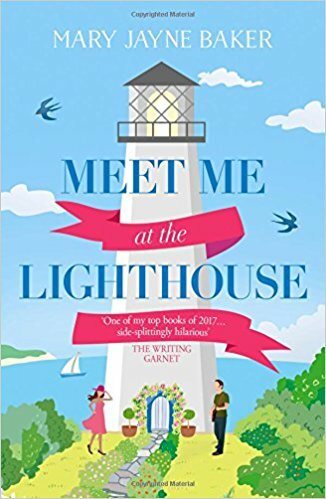 If you love stories about second chances in love combined with beautiful settings Meet Me at the Light House is an absolute must-read. One very lucky reader of With Love for Books will receive a signed paperback copy of Meet Me at the Lighthouse and a gorgeous fob watch necklace. Enter this giveaway for a chance to win a unicorn mug and a Rachel Ellen unicorn sticky notes, tote bag, writing set and tins set. Good luck! Ilke and Nate only spent a short time together, but it was memorable. When Ilke returns to the Whiskey Jack Ski Resort a few months later because she accidentally fell pregnant Nate is perplexed. Nate is working at the resort that is being restored to its former glory to be as close to his son as possible. He loves him dearly and likes being a dad, but he didn't think he'd become a father again and hardly knows Ilke. For Ilke her career as a professional skier always comes first, what will she do now that she is pregnant? Nate is loyal and hardworking and doing the right thing is important to him, but his heart has already been shattered once, will he be able to risk loving someone again, especially when this person is as complicated and independent as Ilke? Nate and Ilke slowly get to know each other better. There are decisions they have to make. However, something heartbreaking happens that will have a devastating effect on their relationship. Will Ilke and Nate be able to move on after everything they are being put through? Is their still new connection strong enough to handle all of the emotions that come their way and will they find happiness again after this awful tragedy? From the Top is a beautiful romantic story. Ilke is used to being on her own. She doesn't let anyone help her and doesn't want to depend on others in any way. This makes it difficult for people to get close to her. Nate is an exception though, she does let him in and somehow she gives him a chance, even though she's never done this before. Nate's previous relationship left him wary. He's still hurting because of his ex-wife's betrayal and spending time with a woman again is a big deal for him. It was interesting to see what these two very careful people would do when true love finds its way into their lives. 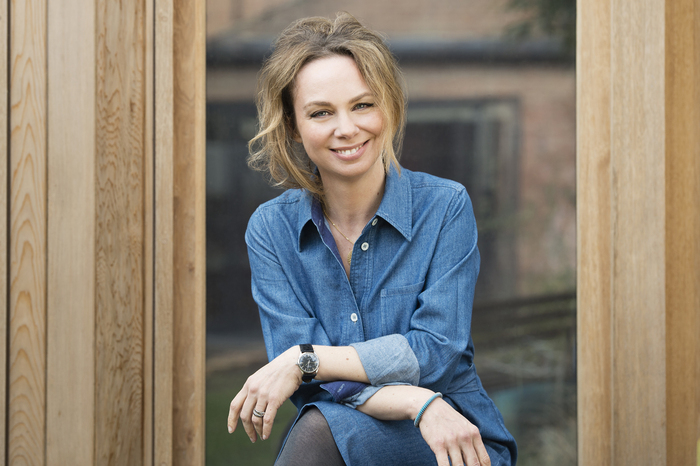 Dani Collins has chosen such a wonderful setting for her story. Her vivid descriptions of the mountains and the resort itself are making it come to life in an incredible way. It was fun to read about the progress that's being made with the resort. There's always something unexpected going on and that makes fascinating reading. It was also great to read more about the main characters from On the Edge again. 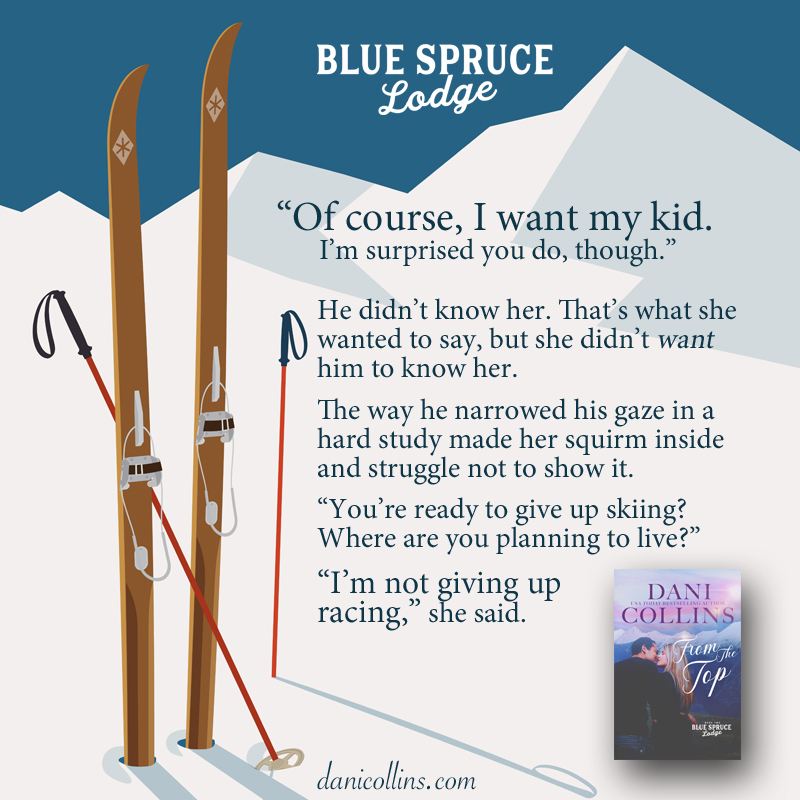 I loved the way Dani Collins continues their stories. 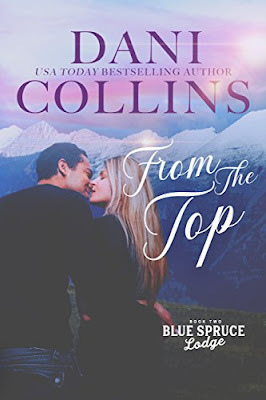 From the Top is entertaining, emotional and sweet. I really enjoyed reading this heartwarming book. If you love complex romantic stories about true love with beautiful settings you will definitely like the Blue Spruce Lodge series. The books can be read as standalones, but to get the full story I'd advise you to start with On the Edge before you begin reading From the Top. 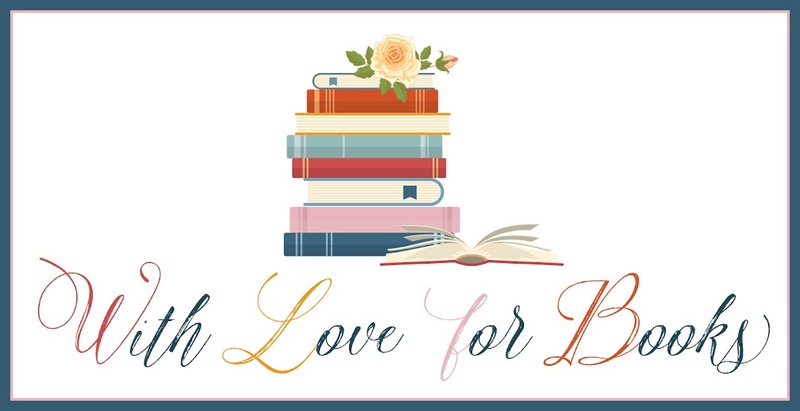 I’m so thrilled to be here at With Love For Books again. Hi everyone! Sure! I’m Canadian. I live in a super small town of fifteen hundred people right next to the American border called Christina Lake. (Go straight north from Spokane, WA and you’re basically on my doorstep.) I’ve been married to my high school sweetheart for twenty-five years, but we began living together five years before that, so I count it as thirty years. We have two kids, one of each, who are both out of the house at school, so we’re empty-nesters. For most of my life, I held down various office jobs. I’ve been published since 2012 and for the last few years, I’ve been writing full-time. 2) You're always writing, how did this passion start? I started reading romance in high school and knew I wanted to do this as a job. When I was twenty-one, I rented a typewriter and gave it a shot. Turns out writing is hard. It took me twenty-five years to sell a book, but through all those rejections and working a day job and raising a family, stories were always in my head, demanding to come out. 3) How did you get the idea for the Blue Spruce Lodge? I knew I wanted to write a series that bridged my Harlequin Presents with its high-fantasy, luxury elements with my more earthy, blue-collar Montana stories. I also wanted to write longer so I would have room for a broader community. I brainstormed with my daughter and she suggested a ski lodge. My imagination flew from there. 4) You write about complicated relationships, what's so fascinating about them? I’m just really aware that life is not as black-and-white and people aren’t as simplistic as we want them to be. For me as a reader, I’m never satisfied with the cookie-cutter characters. I want to know what drives people to behave the way they do. There’s usually a broader story there. I’m also working out my own angst. I’m a perfectionist and beat myself up pretty bad when I’m in the wrong. I like to have my characters be human and make mistakes, then learn to forgive themselves and accept that they’re still worth loving, even though they’re flawed. Oh, I kind of answered it above. Unconditional love. My husband recently told me he would marry me again, knowing me as well as he does now. We were laughing and he said, “That’s saying something!” But he was also being sincere and, to me, that’s true love. 6) You're married to your high school sweetheart, how does your own relationship influence the relationships you write about? We’re pretty honest. Yes, we have disagreements, but we usually get past the temper as quickly as possible and try to get to the heart of the matter. I like to bring that to my characters. Emotions are real, and they’re the way we react initially, but after we cool off, we usually find there are less obvious reasons for our hurt or anger, and that’s the part you have to address if you want to move forward. I also love brainstorming with him, especially for a male point of view. For instance, with the first Blue Spruce Lodge book, On The Edge, I would ask him about his relationship with his own brothers, whether they had rivalries, what sort of trash-talk was crossing a line, that sort of thing. 8) You've written a large number of books already, what makes you keep going? Well, it’s my job and if I don’t work, I won’t get paid. My day jobs were fine, but none were the kind of fulfilling career that this is, so I would much rather do this for a living. I’m a bit of a workaholic, though. I genuinely love what I do and it’s often hard for me to walk away. Today is a great example. I’m writing this on a Sunday. I’ve got my word count in for the day and I’m entitled to the rest of the day off, but I’m here—maybe because the alternative is vacuuming or shovelling snow! Ha. 9) You’re passionate about romance, what do you like the most about the genre and how did this love start? Initially, I simply loved that every romance ended happily. I have no patience for stories that are a lot of struggle and then no one triumphs. I was in a book club for a lot of years and we read a lot of what I call, ‘Oprah picks.’ They were beautifully written, but I didn’t come away uplifted. To me, life is hard enough that I don’t have to be told how hard it is. I like something that says, Life is hard, but hang in there. It’s worth it. I can honestly say that I was inspired by the plucky heroines of romance to persevere with my own dream of becoming a romance author. Related to that, I also love that romance novels are a conversation between women, a positive one. These stories remind women that their feelings and aspirations are important and valid. I personally like books where the characters are people I would want as friends and that’s something I strive to offer my readers. Life is hard and if someone is sitting beside her sick mother in hospital, and I can bolster her spirits by taking her to Paris for three hours, why wouldn’t I want to do that? Write more books! With the kids out of the house, my husband and I talk a lot about what our lives will look like moving forward, but for now we’re working and living, traveling when we can. Or, if you’d like to be notified when my next book comes out, join my newsletter. When you do, you’ll automagically receive a link to download Cruel Summer, a short ebook romance I give away as a welcome gift. http://danicollins.com/subscribe/. Dani Collins will send a postcard to anyone who asks, so please feel free to send her a message. Dani Collins is also giving away a signed paperback of Consequence Of His Revenge on her website. This giveaway will run till March 3rd. You can sign up here. One very lucky reader of With Love for Books will receive signed paperback copies of Consequence of His Revenge and Bought by Her Italian Boss, a postcard and book related swag from Dani Collins. Dana, Harper and Tawny are sisters, but mostly connected during the summer, when they all spent a month at their grandmother's lakeside resort. Annie loved her granddaughters dearly and was always glad they were coming. However, suddenly it stopped. The sometimes sisters, who were already not seeing much of each other, weren't feeling very sisterly at all anymore. Annie's last wish is to bring them back together and when she dies she leaves her resort to her granddaughters. She asks the person who's always been there for her, their Uncle Zed, to get them through it. Will this be a good idea? For Dana, Harper and Tawny owning a resort couldn't come at a better time. They might dislike one another, but they are each in a situation that doesn't leave them much choice. They've all kept secrets from each other, one of the main reasons they aren't close any longer. Will they dare to share what's inside their hearts and maybe find a way to heal and become proper sisters again? Dana is a single mother who could use the stability of finally being home. Her daughter is a real sweetheart and she melts everyone's hearts, which makes it a lot easier for the sisters to start talking again. Harper had to make a difficult decision in the past and she can't get past it. Her life has been standing still ever since and being at the resort gives her a chance to finally start processing her feelings. Tawny managed to land herself in a difficult situation that changed her entire future. Being back at the place she loved so much when she was a child gives her a chance to start over. Will the sisters be able to reconcile? The Sometimes Sisters is a beautiful heartwarming story. Dana, Harper and Tawny don't get along. They have grown apart and resent one another. Running the resort together might seem a challenge at first, but slowly, under Zed's guidance, they're starting to feel at ease with each other again. Zed is a loving man and he has plenty of good Annie stories to share, which made me tear up many times. They're absolutely wonderful and I was spellbound by their gorgeous connection. 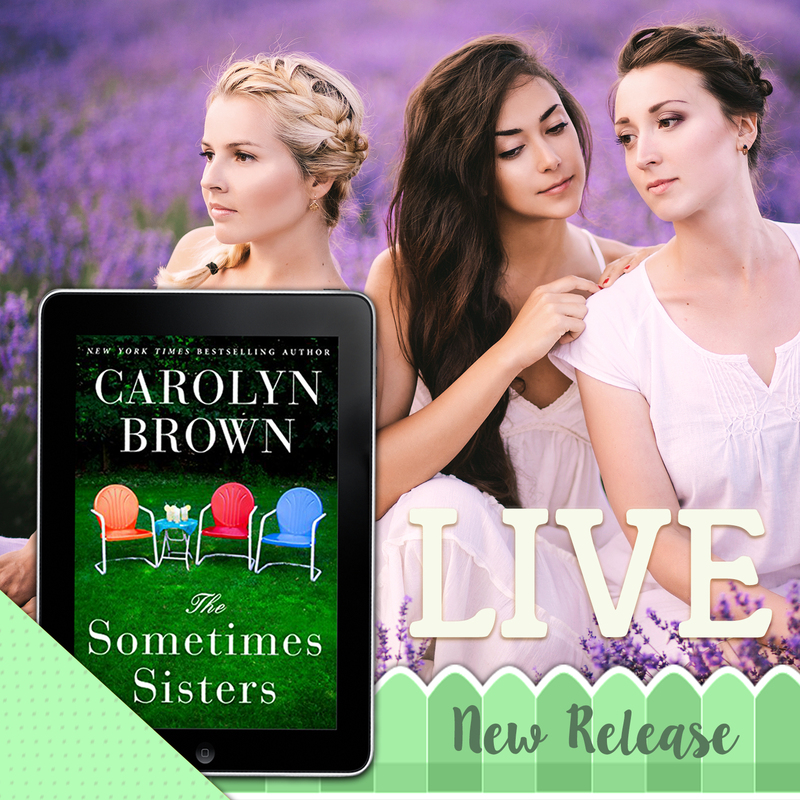 I love stories about families and The Sometimes Sisters is an amazing one. The bond between the sisters is a lot stronger than they think. To move on they have to start peeling off all of their emotional layers, which is an interesting and moving process to witness. I couldn't turn the pages quickly enough to discover more about their secrets and really enjoyed being so anxious to find out if they'd be happy again. 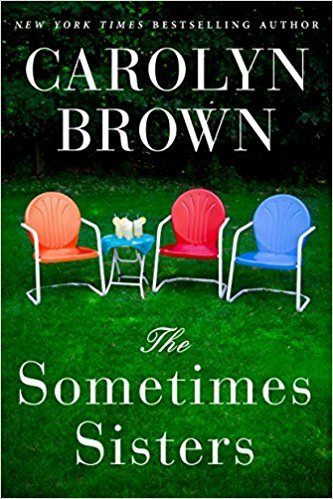 Carolyn Brown's wonderful warm writing is making The Sometimes Sisters an absolute joy to read. It's a special book filled with many precious moments, unexpected twists and turns and complex secrets and relationships. I loved the story from beginning to end and couldn't put it down. The Sometimes Sisters is a brilliant touching story about unconditional love, family, friendship and forgiveness. I highly recommend this delightful story. If you love stories about sisters The Sometimes Sisters is an absolute must-read. I’m a wife, mother, grandmother, great grandmother, aunt, neighbor and friend. That’s personally. Professionally, I’m the author of 89 books and will have 92 on the market at the end of this year. I’m a NY Times, USA Today, Wall Street Journal and Publishers Weekly bestselling author and a RITA finalist. I’ve been married 51 years to the same man and he deserves a trophy for all the support he’s given me. Oh, and he’s a retired English teacher—and his real name is Charlie Brown! 2) The Sometimes Sisters is a story about sisters who initially don’t get along, what inspired you to write about this? Family is described as a group of people who are closely related by birth, marriage, or adoption. That does not mean that they always get along but it usually does mean that if someone says or does something wrong to one sister, that the others won’t step up to defend her. Blood is after all thicker than water. I had two sisters. One I never knew. The other and I didn’t always see eye-to-eye but no one got between us—not ever! 3) Could you describe the sisters in seven words each? 4) What did you enjoy the most about writing a story about sisters? I really enjoyed the characters develop from being barely able to stay in the same room together to depending on each other in times or crisis. 5) What does family mean to you? In one word—everything. But sometimes family doesn’t mean that a person shares DNA with another. With Zed, in The Sometimes Sisters, there was a deep bond, but no actual shared blood. 6) What do you like the most about stories set in small towns? Small towns have a heart beat and pulse of their own. Everyone knows everyone and they know the when, what and where. And they read the local paper to see who got caught. That folks are all up in everyone’s business could be annoying but the upside is that when you need a friend to lean on in hard times, when you need some help after you break arm, or when your sister passes away, there’s support beyond what mere words can begin to describe. 7) How did your writing journey start and what makes writing stories so special? 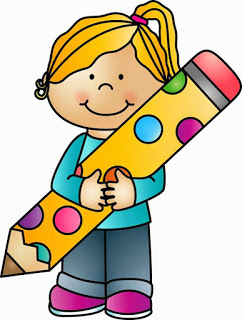 I began my writing journey when I learned to read. I think I was five years old. I wanted to tell stories like those people did in those books that my teacher read to us. I tried to get a toe in the publishing world for twenty years before I finally sold my first two books to Kensington in 1997. That was twenty-one years ago this summer and now I’ve got the job I always wanted. What makes it special? Touching reader’s lives. 8) How do you combine a large family, pets included, with your writing and do they also inspire your stories? My family understands that I’m a full time author and they respect that. My cat—not so much. When he wants to be petted, he could care less if I’m in the zone writing the most important scene of the whole book! My husband is also an author—mysteries—and we spent hours talking characters and plots. Yes, my family inspires characters. In a recent series, my great grandson, Silas, was the inspiration for a little blonde haired boy. And in an upcoming book, my great granddaughter, Zaylie, was the inspiration. I have twelve granddaughters that span a lot of years—that means there’s always whining or giggling going on. Throw in three grandsons and I never lack for inspiration. 9) You write romantic stories about deep connections, what does true love mean to you? Like family—everything. There are layers to every family. Each character comes with back story and by the time I finish a story, I know their grannies, their favorite candy bar and whether they like mashed potatoes or French fries better. It’s those connections that bring out the emotions that make them real. And true love—isn’t that what we’re all looking for? No matter what the relationship might be, sisters, parents, lovers—we like to see an HEA. To write more books! The lineup for this year is: Cowboy Bold (May) will kick off the Longhorn Canyon series; Small Town Rumors (July), a women’s fiction with romantic elements; Cowboy Honor (Sept), the second book in the Longhorn Canyon Series. Coming up in 2019 is Cowboy Brave (TBD) and The Magnolia Inn, plus two or three more books. 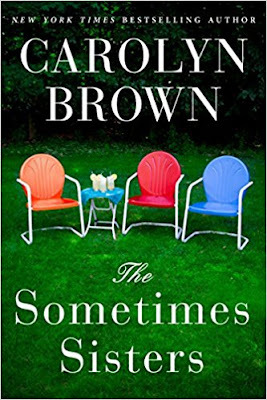 One very lucky reader of With Love for Books will receive a signed paperback copy or Kindle copy of The Sometimes Sisters by Carolyn Brown (winner’s choice). Vicky lives in a small town named Shipden with her teenage daughter and her boyfriend Dex. It's 2024 and when a new and deadly virus is discovered in Africa there isn't immediate reason to panic. Dex and a small group of like-minded people are working for Unicorn. They think the virus is man-made and that it has been spread by the government. They've been preparing for the end of the world. Vicky is not really into Dex's ideas and feels left out when he keeps going to these secret meetings. What will happen when this virus, that caused no panic in the beginning, reaches the United Kingdom? Vicky and her daughter Lottie are in Shipden when the whole town is being put into quarantine. Nobody gets in or out. Dex is out of town at that time, so Vicky and Lottie are on their own. Dex stocked up the house with food and water and packed emergency backpacks for them. He even managed to get them the vaccination for the virus. Vicky and Lottie see their world change before their eyes. People are dying and the army will shoot on sight if they think someone has the virus. Vicky and Lottie are going to try to get to the safe house Dex always talked about. Will they be able to get there in time? Vicky used to live an easy and relatively happy life. Now that this has changed she has to toughen up to survive in this new world. Lottie is a teenage girl and because the world is falling apart, she has to learn to live without all the comforts of her old life. I admired the way Vicky and Lottie are dealing with everything that's going on. Lottie is a smart girl and accepts the fact that things have changed. She adapts really fast and this also helps Vicky a lot. Vicky is feeling insecure and scared and often wonders if she's doing the right thing. She stays strong and still tries to see the good in people. I was hoping for them to find a safe haven so they could rebuild some sort of a life again. Tipping Point is a gripping story about how fast the world as you know it could change. A Tipping Point is the point at which a series of small changes or incidents becomes significant enough to cause a larger, more important change. The fact that a deadly and very contagious virus spreads so fast and does so much damage chilled me to the bones. New viruses are made and discovered every single day, so the fact that this could happen in real life is incredibly frightening to me. Terry Tyler has taken her time to give the story a perfect and well thought out start. This made me invested in it even more. 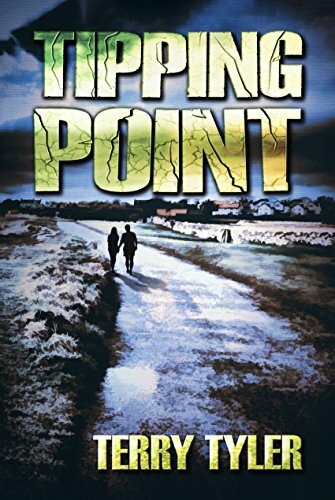 Tipping Point is the first book in the Project Renova series and I can't wait to find out what happens next in the second book, Lindisfarne. If you like to read post-apocalyptic stories with strong female main characters I highly recommend Tipping Point. 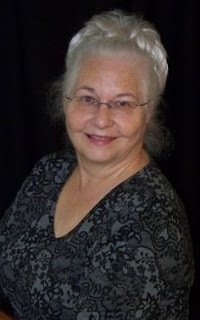 Terry Tyler is a writer with sixteen books on Amazon. Her latest three are part of her new post-apocalyptic series; ‘UK2’, the third novel in the trilogy, will be available in the spring. She is proud to be self-published, and writes many blog posts about writing and self- or indie publishing in general, as well as being an avid reader and book reviewer; she is part of Rosie Amber's reviewing team. Terry is a recently converted vegan, loves The Walking Dead, Netflix, winter, history, South Park and the countryside. She lives with her husband in the North East of England. One very lucky reader of With Love for Books will receive a digital copy of Tipping Point by Terry Tyler. 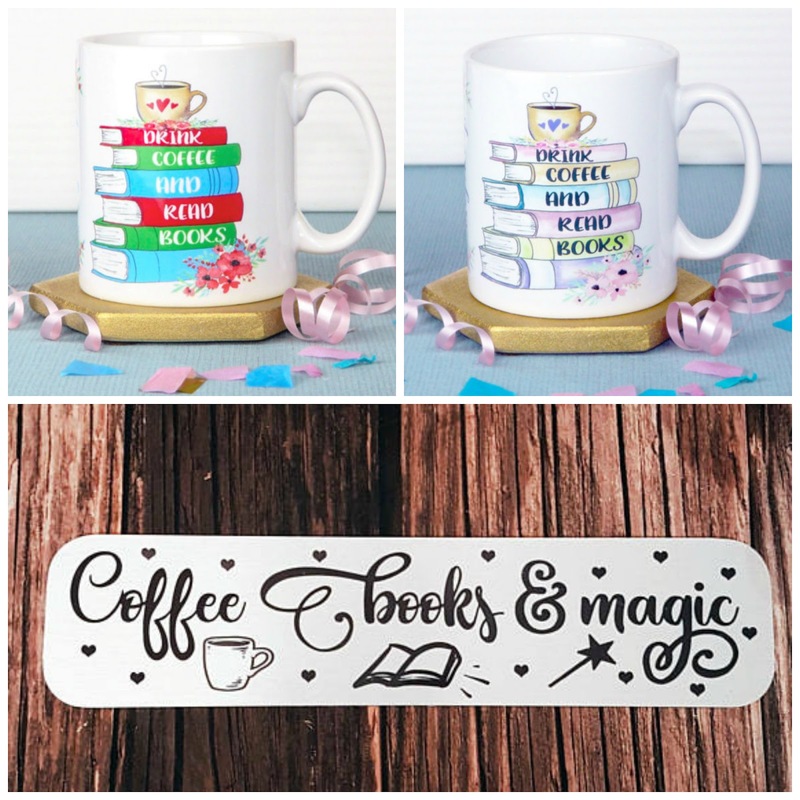 Enter this giveaway for a chance to win Drink Coffee and Read Books mugs and a Coffee Books & Magic metal bookmark made by Miss Bohemia. Good luck! Briggs has found the perfect job for the summer, working for Mrs. B., an octogenarian who lives in a large house on the shore of Lake Michigan. Briggs couldn't have found a better way to escape the fighting about money at home, the constant demands of his grandmother and the difficult relationship with his ex-girlfriend. He can finally do something for himself and he's planning to enjoy every single moment. However, the first thing Mrs. B. asks of him is to dress up, so he can accompany her to a funeral, which will be the first of many. Briggs has been taught by his father that money is the number one objective in life. He's being asked to choose a career that will bring in a large income. Spending time with Mrs. B. and the mysterious girl next door, Abigail, teaches Briggs that there is more in life than work. Briggs's confidence is being tested, he's being pulled out of his comfort zone and the only way he will be able to survive his summer is by being himself and finding out who he is inside. What will be the effect of this journey? The Lake Effect is a beautiful story filled with heartwarming humor. I was immediately captivated by Erin McCahan's writing. It's fast-paced, fun and incredibly deep. Briggs is a sweet guy, but he's had a onesided upbringing and has a lot to learn. Fortunately he meets the magnificent Mrs. B. I loved their easy friendship and adored the fact that young and old are getting along so well in this book. They are fabulous together and this aspect of the story put a big smile on my face. Erin McCahan writes about the difficult things in life like death, chronic illness and losing everything you hold dear in a fantastic open way. Her story is delightfully lighthearted and funny while it still does justice to every serious topic that's being discussed, which I think is an impressive achievement. I really liked the subtile jokes, the gorgeous dialogue and the large number of life lessons that are being given in a fun and feelgood way. They are making this book a true gem and an absolute must-read. 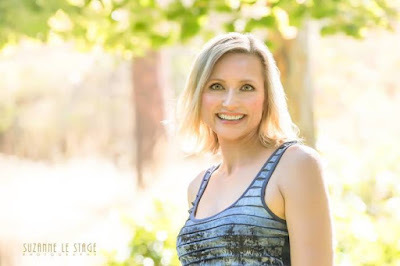 Erin McCahan has written an original and creative story. I was mesmerized by her main characters. They each have wonderful quirks that often made me laugh. I flew through the pages of this book and read it in one sitting. I fell in love with The Lake Effect from the very beginning and highly recommend this brilliant book. It's charming, entertaining, thought-provoking and endearing, a story that will find its way into people's hearts. If you love heartwarming YA filled with humor and wonderful life lessons The Lake Effect is a story you don't want to miss. 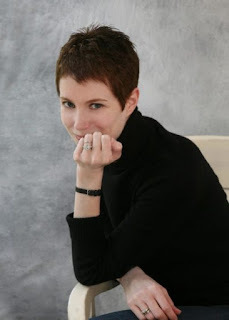 I write contemporary, multi-generational YA novels. My last name is pronounced McCann, but I prefer the way my forebears chose to spell it with that silent, slender h in the middle – no offense to h-less McCanns everywhere. I was born in East Grand Rapids, Michigan, but grew up in Bexley, Ohio. I was so shy in high school that, junior year, the school psychologist pulled me out of a journalism class – really what you want to do to a shy kid – to ask me if I wanted to talk to her. I read loads of fiction, but I read even more nonfiction – mostly Victorian and Colonial history. I would have loved to have lived in either time but with indoor plumbing, modern dentistry and deodorant. Also bug spray. And Advil. I transferred undergrad so many times I lost count. My ringtone is Come Sail Away. All my favorite beaches in the world are in Michigan. My favorite time of day is whenever my husband gets home. I wear my hair this short because my grandfather liked it this way, and I thought – still think – he hung the stars. About writing, all I can say is that I have to do it. Why? I have no idea. 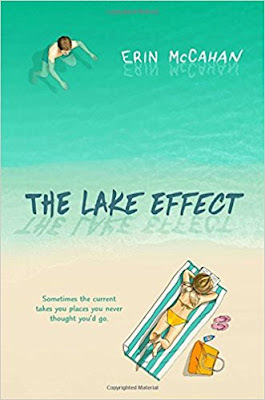 One very lucky reader of With Love for Books will win a signed paperback copy of The Lake Effect by Erin McCahan. 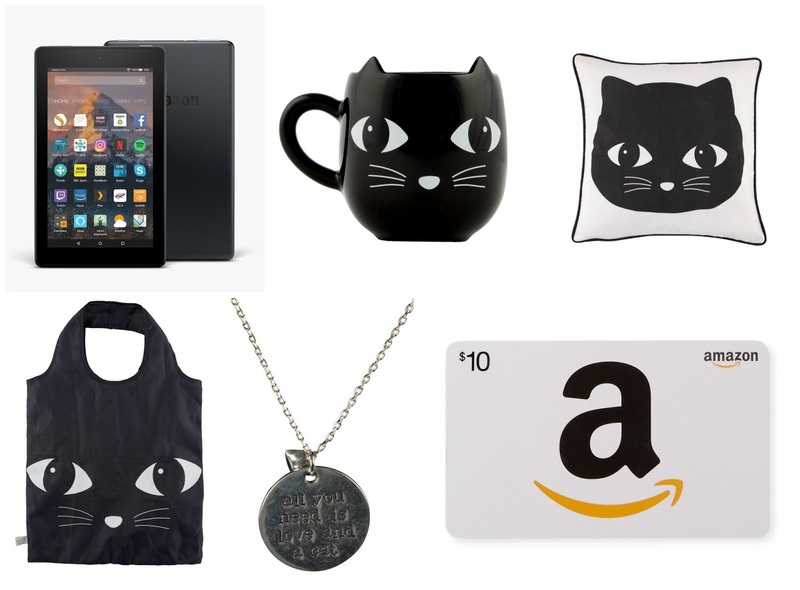 Enter this giveaway for a chance to win a Kindle Fire 7 and a $10 (or equivalent) Amazon gift card, a Sass & Belle Black cat mug, pillow and totebag and an all you need is love and a cat necklace. Good luck! It's 1968 and Rose is in love. She's seventeen years old and has the feeling Joe is the love of her life. Rose's vibrant nature and her love for life perfectly suit him and they are happy together. When Rose falls pregnant Joe wants to marry her, but Rose's parents have other ideas. They send their daughter to Ireland, where they are originally from, to have the baby in a convent. Afterwards the child will be taken from Rose. Rose is being forced to give up the little girl she loves so much. Martha has a loving family, so she never felt the need to look for the parents who gave her up for adoption. She was always discouraged to do so and she agreed. Now that she's single again after being married to a charismatic man, who found love with someone else Martha doesn't feel complete. Her daughter Evanne encourages Martha to look for her birth mother. Martha starts a search that will uncover many family secrets and shocking truths, will she be ready for everything that is about to come her way? The American Girl is a beautiful impressive story. Rose has to give up her baby while she doesn't want to, which is heartbreaking. Her parents send her to Ireland where she's being treated cruelly and she's being forced to give up her child. Reading about this brought tears to my eyes, especially because this has been the sad and harsh reality for so many women. I love that Rachael English has written a story about this painful subject in such a stunning emphatic way. Martha is an intelligent woman. She's in her forties and needs to start over. Fortunately she has her daughter Evanne, a wise girl who knows what she wants. They have a strong connection and Evanne encourages her mother to find out more about the woman who gave birth to her. I love how she helps Martha through this difficult process and found this amazing mother-daughter bond one of the best parts of The American Girl. It warmed my heart to read about their love for one another. They don't always agree, exactly the way it should be, but they are there for each other when it counts. 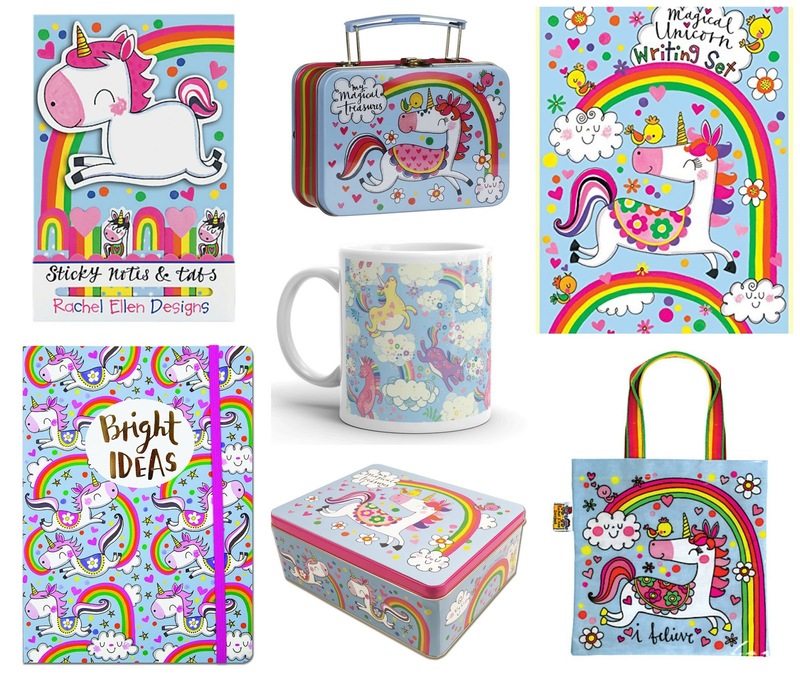 Rachael English makes their story come to life in an incredible way. 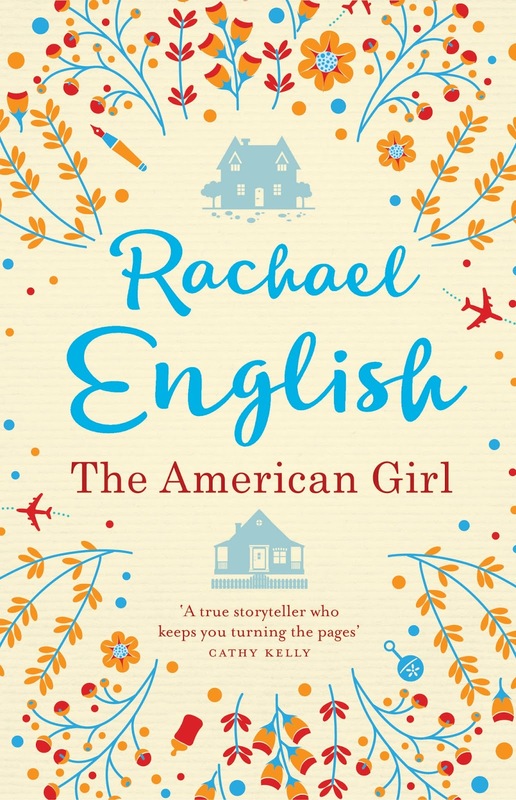 The American Girl is captivating and gorgeously written. It's a story about missed opportunities, second chances, secrets and family connections. I loved the way Rachael English describes her main characters, settings and emotions. Everything is thoroughly researched and I could feel so many different emotions behind her words. 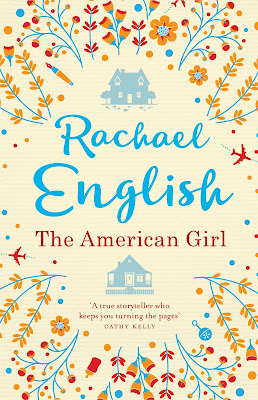 The American Girl is a fantastic book filled with surprising moments, fascinating cover-ups and terrific deep connections. I highly recommend this mesmerizing book. If you love stories about complex family connections you should definitely read The American Girl. 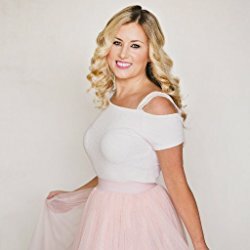 Her second book, EACH AND EVERY ONE, was published in September 2014 and her third novel, THE AMERICAN GIRL, was published in April 2017. Like GOING BACK, both were top five bestsellers in Ireland. One very lucky reader of With Love for Books will receive a signed paperback copy of The American Girl. 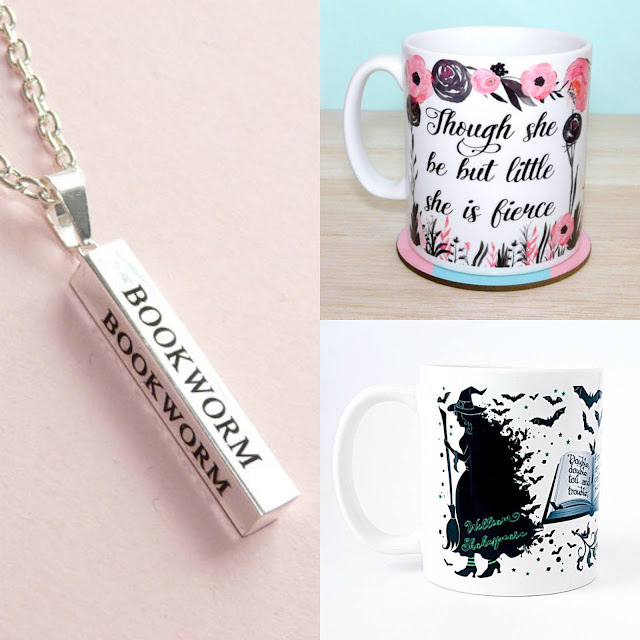 Enter this giveaway for a chance to win Shakespeare mugs and a Bookworm necklace made by Miss Bohemia. Good luck! Will got a second chance, something he's grateful for every day. He was a heroine addict with a large debt he couldn't pay off and his life was in danger. His wife, a pathologist, gave him the opportunity to disappear. Will turned his life around and is now a counsellor, helping addicts on their way to recovery. Will only shares his secret in his support meetings with other addicts and the last thing he expects is being confronted with his past, but that's exactly what happens. Will's new patient Thea has a difficult history. She ends up in rehab because of a social media addiction. Thea's company, Alibis, gave clients false internet identities for all sorts of reasons. Thea is a master manipulator and she obviously has something to hide, but what is it? How can Will uncover more, and especially accurate, information about his new patient and what will he do when he finds out everything he should know? What is the truth about the mysterious Thea? 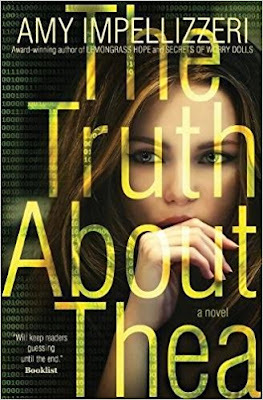 The Truth About Thea is a fantastic gripping story. I was curious about Thea from the start. I love stories about secrets and it's clear she has a lot to hide. I couldn't turn the pages quickly enough to find out what it was. Thea's business landed her in a big mess, but being sent to rehab instead of prison might save her from a terrible fate. Thea is fierce, evasive, enigmatic and aloof. That makes her incredibly fascinating. Will doesn't know what he's dealing with exactly. He's a good therapist, but there's something about Thea that makes him eager to learn more, but also anxious because of what he might find out. I liked that contrast and enjoyed anticipating what he'd uncover. Amy Impellizzeri has written a clever plot filled with suspense and smoke screens. I was impressed by the way her story has been put together. It's well written, there are plenty of unexpected twists and turns and there are many puzzles to solve. I loved being surprised. The Truth About Thea keeps changing direction and that makes it intriguing and thrilling. Amy Impellizzeri kept me on the edge of my seat from beginning to end. I really loved The Truth About Thea, it's a terrific spellbinding and intelligent story. If you love a good suspenseful mystery The Truth About Thea would be an excellent choice. My first novel, "Lemongrass Hope," debuted in October 2014, as an Amazon best-seller (Romance/Fantasy and Romance/Time Travel) and now I'm a full-time writer, even though it looks like I'm eavesdropping on people at the local coffee shop. Just kidding, I am eavesdropping. My sophomore novel, "Secrets of Worry Dolls," released on December 1, 2016 and was just named a Bronze Winner in the INDIEFAB Book of the Year Awards (Multi-cultural Category) (YAY!) My third novel, "The Truth About Thea," was released on October 17, 2017 and is a Francis Ford Coppola Books & Bottles inaugural pick. 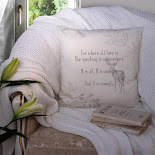 One very lucky reader of With Love for Books will receive a Kindle copy of The Truth About Thea by Amy Impellizzeri. Juliette is losing her battle against cancer. She gets the devastating news that she doesn't have long to live, it's only a matter of weeks. Juliette doesn't know how to tell her fifteen-year-old daughter Rosie. There's so much she still wants to share with her daughter and now she has to leave her before she's even grown up. To make some last memories with Rosie, Juliette decides to travel to Killara, the place in Ireland where she spent such a happy times many years ago. Will this holiday bring Rosie and Juliette what they need? Shelley doesn't know how to keep going. She lost her little girl and every day is a struggle. Being a mother was all she ever wanted and now she's completely lost. She isn't ready to be social, she can't love her husband the way she should and she doesn't let anyone come close to her. Shelley's grief is all-consuming. Her daily routine filled with misery changes when she meets Rosie and Juliette. They know what tragedy feels like and this bond makes it possible for Shelley to communicate with them. However, becoming friends with a dying woman might bring her even more grief. Will Shelley dare to take a chance and what will happen if she does? A Part of Me and You is a beautiful heartbreaking story. Juliette knows she will have to leave her loved ones behind, while she isn't done living yet. Juliette loves Rosie with all her heart and there's so much she still wants to share with her daughter. Shelley is alive, but she's done living. She's given up and doesn't want to keep going. Juliette doesn't know how to say goodbye and Shelley isn't interested in being part of the world any longer. Shelley forms a deep and meaningful connection with Juliette and Rosie that helps them all through difficult times and makes the transition easier for them. I shed quite a few tears while reading their fantastic compelling story, it's sad, but also hopeful. 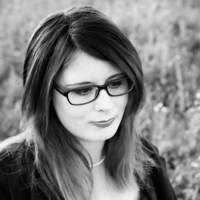 Emma Heatherington has written an impressive poignant story about loss, grief, love and fate. A Part of Me and You is emotional and thought-provoking. It's impactful and I love when I feel many different things when I'm reading a story, A Part of Me and You is a rollercoaster in that area. 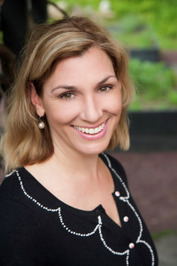 Emma Heatherington knows how to build tension, she skillfully explores every aspect of each layer of her main characters' personalities and she accurately describes all parts of the process they're going through. I absolutely love how gorgeous, detailed and captivating her writing is. A Part of Me and You is a mind-blowing story. If you love emotional stories about beautiful friendships you should definitely read A Part of Me and You. Emma Heatherington is from Donaghmore, Co Tyrone where she lives with her children - Jordyn (21), Jade (16), Dualta (16) Adam (15) and Sonny James (2). 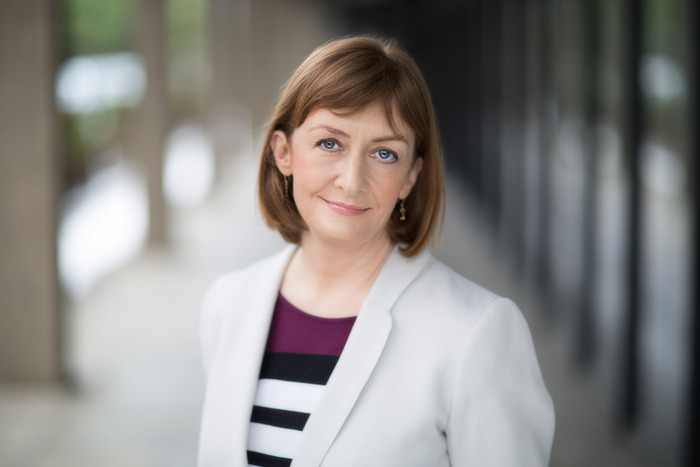 She has penned more than fifty short educational films, plays and musicals as well as six novels for Poolbeg Press, two of which were written under the pseudonym Emma Louise Jordan. Her latest signing with Harper Impulse (Harper Collins) saw the re-release of her first book Crazy For You (originally Dodder Books) in 2013 and The Legacy of Lucy Harte (Jan 2017). A Part of Me and You will be released in January 2018. She also worked with country legend Philomena Begley on her official autobiography (The O'Brien Press) which is available from November 6th 2017. Emma loves spending time with her partner (the international artist and singer/songwriter Jim McKee - jimmckeeart.com) all things Nashville, romantic comedy movies, singalong nights with friends and family, red wine, musical theatre, new pyjamas, fresh clean bedclothes, long bubble baths and cosy nights in by the fire. 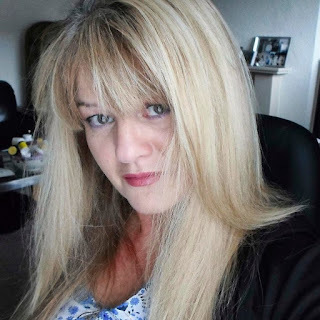 I’m a 41 year old writer from Ireland, a mum of five (ranging from almost 22 years old to a lively 3year old) and a lover of live music, theatre, travel, food and red wine. I live in a little village in County Tyrone with my partner Jim McKee who is a singer/songwriter and visual artist and our home is very relaxed, very creative and with so many of us living there, usually very messy! Juliette (who is terminally ill) is brave, strong, maternal, positive, determined, hopeful and spiritual – Shelley (who Juliette meets when in Ireland) is sad, lonely, lost, nurturing, grief-stricken, broken and creative. Rosie (Juliette’s 15 yr old daughter) is frightened, longing, angry, loving, warm, gentle and courageous. the many emotional scenes that come with it? I write very much from the heart and from my own personal experiences which I use to try and convey the emotion in my books. I cry when I’m writing the big emotional scenes which I always feel is a good sign, and I cry again when I read them later! We all have our own experiences of good times and bad times in life and I have mine and I suppose I tap into those feelings when I need to. Plus I have a fabulous editor who squeezes every drop of emotion out of me until I have no more, ha! I lost my own mother when she was just 36 years old and I’m the eldest of six children (I was 15, the baby was 8mths old at the time) so I took a lot of how I felt at that time and put it into the character of Rosie who faces the same fate as she watches her young mother in her final stage of life. We had no warning when we lost our own mother, but I tried to imagine what a teenager might feel if she knew what was around the corner. two at first sight extremes? I try and give some sort of life lessons in my stories. Unfortunately we all have to go through some shades of darkness in our lives but there will always be light if we look for it in the right places and the right people. Kindness, human touch and love can get us through the toughest of times and we should always try and reach out for others in need. I believe that true happiness doesn’t always come from helping ourselves, but rather in helping others and that’s the theme of my work at present. My previous books (before The Legacy of Lucy Harte which was released in 2017) were romantic comedy, so maybe the comedy and lighter side of life still creeps in subtly in places too helping me balance the positive and negative aspects of my stories. 5) You write about family connections, what does family mean to you? I have a very close knit family and we all look out for each other, even into my extended family. There are 40 cousins in total on my mum’s side alone and we are all great friends. Maybe it’s an Irish thing to have such big families, but I absolutely love the feeling that someone will always have your back. I remember arguing with my sister when we were very young and my mother telling us that when we were older we would be best friends and we turned up our nose at the idea, but of course she was right. I love making memories now with my own children, visiting places and doing nice things together when we can. We have been to France for the past two years on holiday and this year we are off to Italy to my baby sister’s wedding which we are really looking forward to. Every Christmas we all gather in my dad’s house after dinner and have a bit of a sing song. It’s bittersweet as we always know there’s a big hole in our lives since we don’t have our mother anymore, and maybe that’s why we are all so close. I suppose I don’t know any different, it’s just how we are and always have been. I love to travel but I’m also very content at home. We bought a slow cooker recently and Jim and I joke that it’s a big moment for us to put the Sunday roast on the night before – I think that’s a nice sign of contentment that comes from having a happy, healthy family. 6) How did your writing adventure start? I think I’ve always been a creative writer of sorts from a very young age. In primary schools I made up new versions of school yard rhyming games. At the age of 12 I was writing songs in my bedroom and dreaming of being on Top of The Pops (my singing voice is as Simon Cowell would say ‘distinctively average’ so that was never going to happen!). I carved out a career in PR and Event Management after university but it wasn’t until I was almost 30 that I entered a short story competition in a magazine and won it that writing became a more serious part of my life. Several book deals with Irish publishers followed and I penned 5 rom coms and 2 romantic suspense books under the pseudonym Emma Louise Jordan before I signed with HarperImpulse (HarperCollins). The Legacy of Lucy Harte is a special book for me and it was the first new work with Impulse. It took me a long time to write it as I had a baby in the middle of putting it together. A Part of Me and You was written last summer (a lot quicker than Lucy Harte!) and I enjoyed every moment of it. about tackling so many different forms of writing? I am very privileged to have had so many cross genre opportunities come my way and I’ve learned my craft by writing for very diverse clients and subject matters through scriptwriting for short film and stage (these topics could be anything from teenage issues such as drug and alcohol awareness, suicide awareness, night crime, mindfulness and wellbeing to family health topics such as blind cord safety awareness, road safety issues, mental health awareness etc). I owe a lot of this experience to my local theatre ‘Bardic’ with whom I penned my first musical and to Beam Creative Network, a local agency who employ freelance artists to delve into these areas for public sector clients. I always love the challenge of tackling a new subject matter for a new audience. I also write scripts which aren’t to commission but which come from my own imagination of course, and my partner Jim and I penned a children’s musical called Scarecrow Fred which we had great fun producing and directing – we still take it around schools in a workshop format and it’s a real labour of love. I love writing song lyrics – it’s what I started out doing and I’m delighted to again have been given opportunities by singers and theatre practitioners to explore that side of my work too. The best part of writing in so many fields I think is how all that experience combined makes me a better writer overall. I think writing is like any craft – the more you practice, the better you get at it. Plus, it gives you confidence as writing can be a lonely old job – I still remember the first time I heard a live audience laugh at my scripts. It really was a ‘pinch me’ moment. 8) How do you combine your writing career with having a large family? Aha, the million dollar question! I don’t have any magic formula or secrets to how I juggle and I don’t think any working mother does. It can be very hard to get the headspace to write with such a busy family life but I believe that if you really want to do something, you’ll make it happen. As I said, my house is normally a bit of a mess but it’s homely and welcoming and a creative hub so I suppose that’s where I fall down in my time management! I’m more likely to be dreaming up stories than vacuuming but in saying that, some of my best ideas tend to come when I’m mopping floors for some reason...seriously! Writing is how I earn a living now and it’s the type of job that has no start or finishing time. I write around my three year old’s routine as the older kids are all at school, so it’s really when he goes to bed at night that I get stuck in. Jim paints in the kitchen and I write from the living room. Maybe one day we’ll have our own proper working quarters but for now we’re getting by and for two people who both work from home around teenagers and a toddler, I think we’re managing pretty well! people never forget to live and cease the day? I’ve had first-hand experience of how cruel life can be when we lost our mother. I try not to overthink it, but sometimes I really can’t get my head around how a wife and mother of six who was so caring, so fun loving, so sociable, so talented, so popular and so much in her prime could be taken so suddenly. I still look back in awe at how my family, including my father, have come so far when we were robbed of our precious mother so young. When I turned 36 (the age my mother was when she died) I think it struck a chord with me that this could all be over any day. Thank goodness we don’t know what is coming next but I’ve certainly learned that nothing is guaranteed, to take absolutely nothing for granted and that life is very precious, very fragile and that none of us are getting out alive so give it your best shot and be nice to those around you – we’re all in the same boat! 10) What does unconditional love mean to you? I believe that unconditional love is the one type of true love. It doesn’t come with expectations or judgement or blame. It is forgiving and quiet and sometimes unexplainable as it is just there and it never goes away. It’s the type of love as I mentioned before where you know that someone has your back. We all make mistakes, we all lose our way at times but with unconditional love in our life we can always find our path again. Unconditional love is supportive, it’s caring, it’s meaningful and it’s pure. It’s the love between parent and child, brothers and sisters, partners, husbands and wives (when the right people get together!). I suppose in a nutshell, unconditional love is family. I’m working right now on my next HarperImpulse novel which has a working title of ‘The Angel of Hope Street’ and I’m really enjoying. I’m also ghostwriting an autobiography (my second time doing this!) for a very famous country singer here in Ireland and the UK, and both of these projects are keeping me very busy. Further down the line I hope to write more novels and who knows, maybe a screenplay version of one of my books. That would be the ultimate dream come true for me, if one of my books were to make it onto the big screen. The Legacy of Lucy Harte will be released in Holland in March so that’s something that’s happening in the very near future and A Part of Me and You will be out in Germany in Jan ’19. I already feel very blessed to have come this far in my writing career and I feel very lucky to be doing something I genuinely love. The messages I get from readers from all over the world have been absolutely mindblowing and a true honour to receive, so thank you to all who have got in touch after reading my books. I can honestly say that (apart from teenagers, school runs and a toddler yelling for breakfast), my urge and love of writing is enough to get me out of bed in the morning and look forward to the day and best of all, I don’t even have to change out of my pyjamas or leave the house to do it! I’ll just keep on mopping floors and hopefully the ideas will keep on coming. That’s what I hope for in the future. 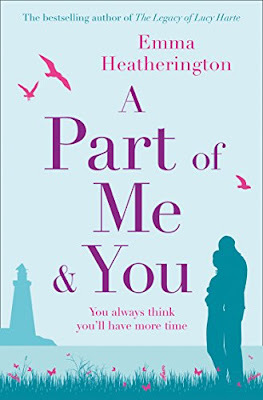 One very lucky reader of With Love for Books will receive a bound manuscript of A Part of Me and You by Emma Heatherington.